Lemon-flavor JELL-O Gelatin and frozen lemonade concentrate give this crowd-pleasing chilled dessert a super-citrusy appeal. Stir boiling water into dry gelatin mixes in large bowl at least 2 min. until completely dissolved; set aside. Beat cream cheese and lemonade concentrate in large bowl with electric mixer on low speed until well blended. Add gelatin; mix well. Refrigerate 2 hours or until thickened (spoon drawn through leaves definite impression). Add whipped topping; stir with wire whisk until well blended. Pour into serving bowl. Refrigerate 4 hours or until firm. Garnish with berries and lemon slices just before serving, if desired. Store leftover dessert in refrigerator. 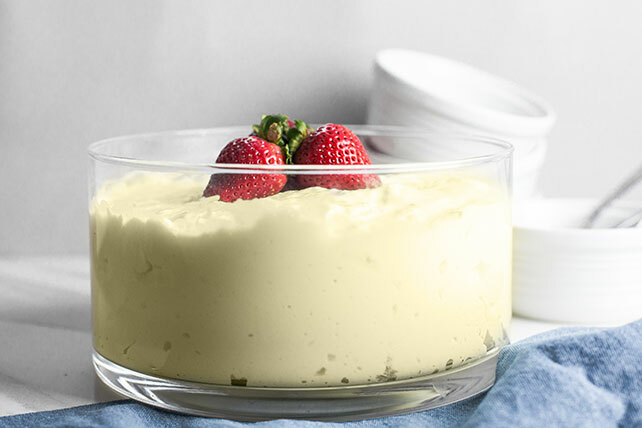 Cool off with a 1/2-cup serving of this creamy dessert. Prepare as directed, using JELL-O Strawberry Flavor Gelatin. Garnish with sliced fresh strawberries, if desired. Makes 14 servings, 1/2 cup each.